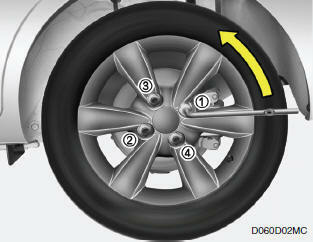 The wheel nuts should be loosened slightly before raising the car. To loosen the nuts, turn the wrench handle counterclockwise. When doing this, be sure that the socket is seated completely over the nut so it cannot slip off. For maximum leverage, position the wrench so the handle is to the right. Then, while holding the wrench near the end of the handle, pull up on it with steady pressure. Do not remove the nuts at this time. Just loosen them about one-half turn.